A sleep researcher at National Jewish Health in Denver monitors a patient who is sleeping without a CPAP mask, which is commonly used to treat sleep apnea. In a recent pilot study, experts showed patients video of themselves struggling to breathe during the night without their CPAP masks. After watching the dramatic, often disturbing videos, patient usage of CPAP masks increased considerably. (DENVER, Colorado) – More than 20 million Americans are diagnosed with sleep apnea, yet more than half of those prescribed a CPAP mask to keep their airways open at night don’t use it. John Brugger was one of them, until he watched a dramatic and disturbing video of himself trying to sleep without his mask. Since that day, Brugger has never slept without his mask on. It’s a method Mark Aloia, PhD, a sleep expert at National Jewish Health, hopes will increase compliance with CPAP masks. “We somehow had to find a way to convince these patients of the urgency of their condition in order to change their behavior,” he said. 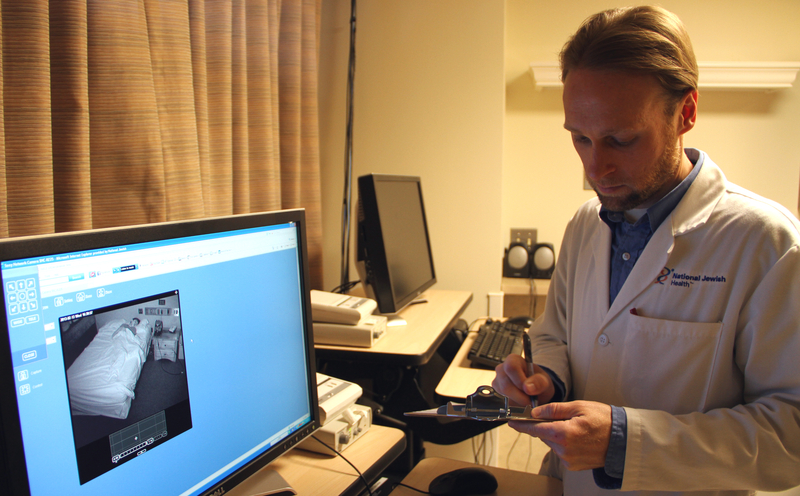 Aloia led a study at National Jewish Health that monitored sleep apnea patients overnight in a sleep lab, then showed them videos of themselves struggling to take in air while sleeping. “We saw an average increase in the use of CPAP of nearly two and a half hours a night in those who watched a video of themselves, compared to those who watched a video of another patient with sleep apnea. And after three months of follow- ups, the patients were still using CPAP masks,” said Aloia. The results, presented at the annual meeting of the Associated Professional Sleep Societies, were even more dramatic when compared to patients who didn’t watch a sleep video at all. Those patients used CPAP about half as much as the patients who watched videos of themselves. Left untreated, sleep apnea has been linked to serious medical conditions, including depression, diabetes, heart disease and even cancer. Seeing is believing for John Brugger, of Commerce City, Colo. Brugger rarely wore his CPAP mask for sleep apnea because he thought it was uncomfortable, but after watching dramatic video of himself struggling to breathe at night without the CPAP mask, Brugger changed his mind. 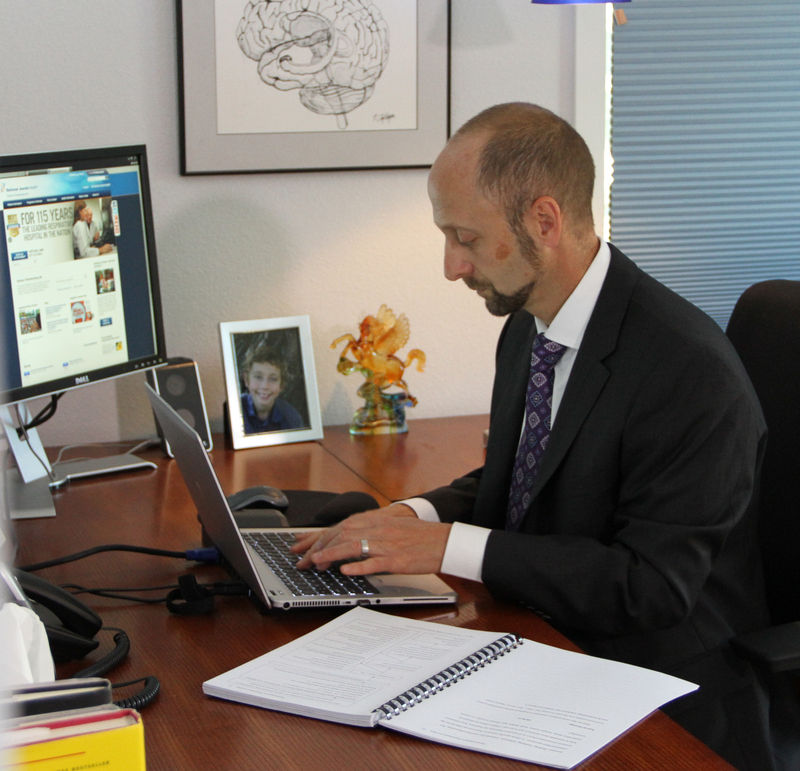 The video was part of a pilot study by sleep and respiratory experts at National Jewish Health in Denver. 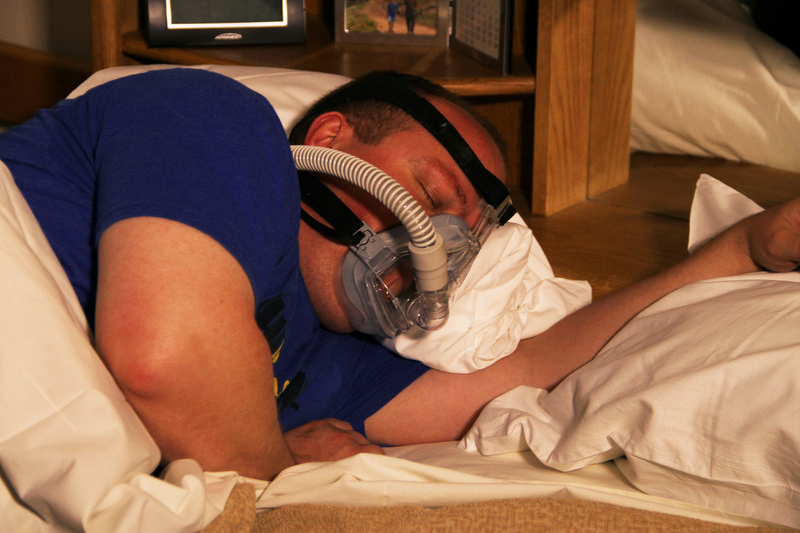 John Brugger of Commerce City, Colo. uses a CPAP mask to treat his sleep apnea. Like more than half of those who have them, Brugger rarely wore his mask, but changed his mind after experts at National Jewish Health in Denver showed him video of himself struggling to breathe overnight without it. 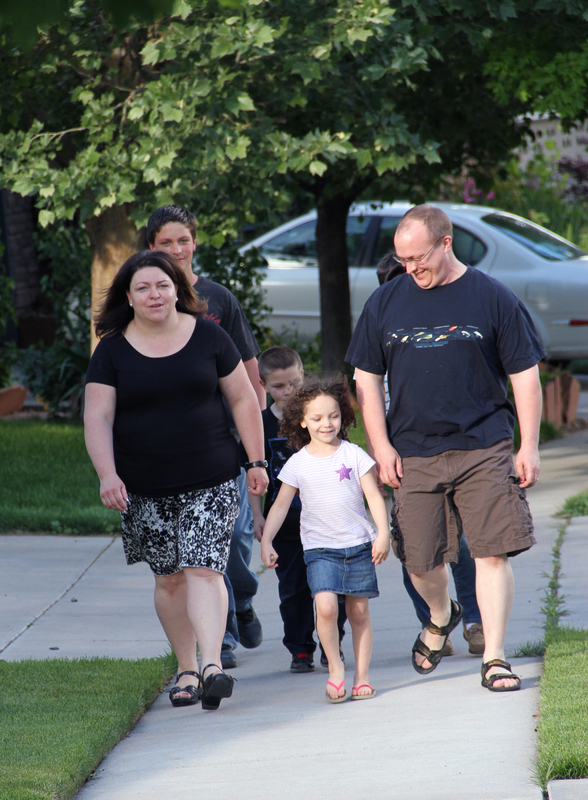 John Brugger, right, takes a walk with his family in Commerce City, Colo. Brugger says consistent use of a CPAP machine to treat his sleep apnea has increased his energy level considerably. Brugger rarely wore his mask until he took part in a pilot study at National Jewish Health in Denver. During the study, patients were shown dramatic video of themselves struggling to breathe at night without their CPAP masks. After seeing themselves on camera, patient usage of CPAP machines went up substantially. Hoping to get patients to wear CPAP masks more consistently while they sleep, Mark Aloia, PhD, of National Jewish Health in Denver, took a novel and emotional approach. 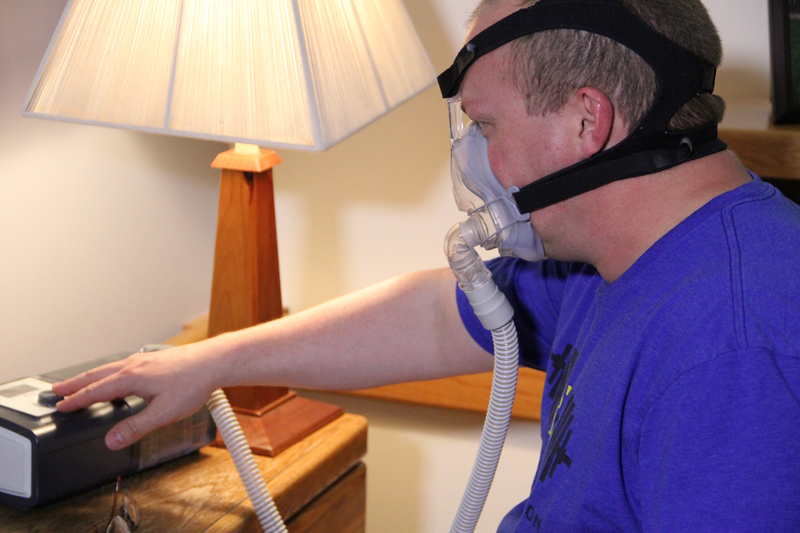 Aloia videotaped patients overnight as they struggled to breathe without their CPAP masks. After showing patients the video of themselves, CPAP mask usage went up considerably.